Eeek! 10 days until Christmas! Browse: Home / baking / Eeek! 10 days until Christmas! And someone who shall remain nameless is a tad unorganised! So please forgive my lack of blogging this past week (’cause I know you all have nothing more to do than hang breathlessly of my every post, right? Huh? what? You have a life? Oh. How embarrassing…), but I’ve been a tad busy. I was working, I was Christmas-partying my way ’round the morning tea circuit, and attempting to be reasonably prepared for Christmas. Shopping – started yesterday. Most of my family done, except BIL (no idea) & grandmothers (choccies). Slightly started DH’s family, except for the gifts that have to be mailed (do I dare mention one needs to be posted overseas? Oops!). Oh, yeah, and the boys. Big boy have two stocking stuffers, small boy nothing as yet, poor dear! Cards – stamped. Being painted as we speak. Ribbons to be attached. Greetings to be written. 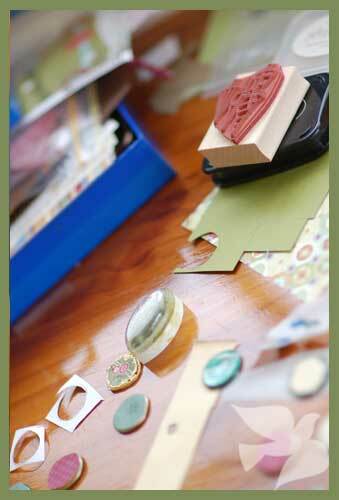 Gift-wrapping – wrap purchased, gift tags under construction. Some gifts wrapped at purchase. These are charms made from beer bottle caps (very neo-bogan if I do say so myself! They’re noice, different, unewesual! ), based on a tute I found over here. I’ve been procrastinating on these, because I can’t get the painted bit to look right. 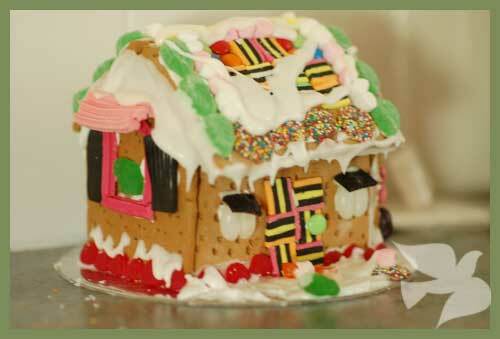 Christmas craft #2 – gingerbread house – done! Now just to wait until Christmas Eve so we can eat it! 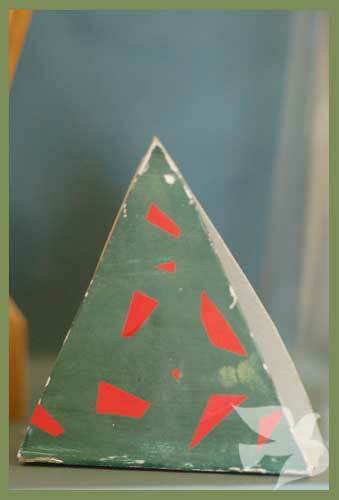 Christmas Craft #3 – a toddler’s Christmas Tree. We were a bit late putting up our tree, and DS kept asking for one, so we made one! Christmas baking – I want to make some more (non-evil) Santa’s for my DH’s workplace, if I get time. Sigh. Lots to blog this week coming – another Christmas collage, the Christmas cards & tags I am working on at the minute, the cookies if I bake them, a small watercolour in the works, hopefully a couple of pastel drawings. Please tell me I’m not the only disorganised one? You are one busy lady! No one would believe you are doing all this with a newborn. If it makes you feel any better I’m off to post my overseas parcels today as well… They’ll get there eventually even if they don’t quite make it in time for Christmas. nope, you’re not the only one disorganised You’ve been super busy, love the gingerbread house. Merry Christmas to you!